Voyager witnesses supernovae that turn out to be the explosions of an all-out Q Continuum civil war. Matthew: A story should do one of two things (but preferably both). It should put forward an interesting idea, or it should advance the narratives of character we care about. I think this episode tries to do the former, but fails. It succeeds at the latter, but not in any particularly satisfying way. So what's the big idea? A Q civil war, and the Q changing their nature in response to it. So, fine. I think, on their face, these are worthwhile ideas. I can imagine a lot of interesting things to have omnipotent beings fight about. Or, alternatively, to show what the limits of otherwise putatively omnipotent beings might be. But really, we get none of that. I like the continuity reference to the Quinn storyline, but the stakes of this war are just not evident. Then, we get this kid angle. 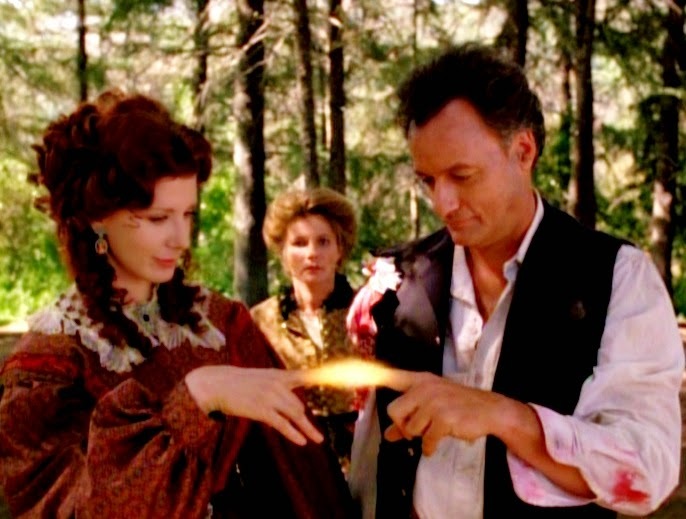 Q makes an interesting pitch to Janeway, about their child radiating waves of compassion through the continuum. This is reminiscent of TNG's "Hide and Q." But then... Q and Lady Q have a kid instead, and this solves things in a way somehow similar to Q and Janeway procreating? Wha? Kevin: I have several issues with the civil war story's execution. First, it just makes no sense that Q is a union solider in this conflict. They're the ones rebelling. I get the idea of putting our heroes in the uniforms of the pro-slave side of the historical conflict would leave a bad taste in everyone's mouth, but then they should have just used a different war as the backdrop. If nothing else, the American Civil War wasn't about the same flavor of civil discord. There are other conflicts that would have been a more interesting parallel for what Q's idea represented. Also, how would a baby, be it Q or Q/human hybrid help here? If anything, wouldn't it just cause another nexus of conflict in the continuum? Everything from the set up to the resolution just happened by fiat. In the end, for better for worse, this felt like an excuse to bring Q back and find the right story later. Matthew: There is a point in this story's plot where I just think there is something missing. Lady Q helps the Voyager crew enter the continuum. Then, somehow, they're wearing Civil War uniforms and wielding the Q's own weapons against them? So look - I enjoyed the use of the Civil War backdrop, just like I enjoyed the desert gas station in "Death Wish." But without one or two more connective scenes, one explaining the rules of this reality (a la "Qpid") and one explaining howthe Voyager crew can fruitfully interact with it, it just comes off disjointed. Kevin: I enjoyed the gas station so much because the austerity punctuated by the odd image was fun and really helped communicate the 'otherness' of the continuum. The Civil War setting was too literal for me. There was nothing about it that inspired the same sense that I was in a truly different place. For the reasons I discussed above, the Civil War imagery didn't seem a good fit for the actual conflict being staged. And the idea that the crew is using Q weapons was just part of the deus ex machina ending for me. Matthew: Plot criticisms aside, there are some undeniably fun scenes here. Lady Q gets a good number of funny lines as she belittles the crew. Q's pursuit of Janeway isn't as off-putting as his pursuit of Vash in "Q-Less." I enjoyed the interactions with the Robert E. Lee stand-in. All told, the majority of scenes here are fun to watch. The episode just lacks some unifying threads to pull it together. Kevin: Here, I agree. DeLancie and Mulgrew are friends in real life and they really mine their rapport to make some fun moments. It lacks the narrative punch of facing off with Picard, but you can't deny that their scenes are a riot. Matthew: John De Lancie does a good job switching between puckish imp and serious fighter for a cause. His comedic lines never go overboard, but he also delivers some serious lines with aplomb, such as when he pleads for Janeway's life. I really enjoyed Harve Presnell as the Colonel, too. He was perfectly cast as a Confederate, but he gave just enough to hint at the complexity of a Q playing such a role. Kevin: Yeah, I have nothing really to add. Maybe it was the the rapport with Mulgrew, but his pursuit of Janeway did read funnier than creepier, and in the hands of a lesser acting team or script, it could have gone that way very easily. His line readings in the serious parts are as close as the script gets to working, merely on the strength of the acting. Matthew: Ah, Suzie Plakson. Now, this is not to downgrade any of her prior or future performances. They all have their nuances and their joys. But this may be the role in which she is most fun to watch. She delivers her snarky lines with such arch readings, it's sooo much fun. And darn it if she doesn't look fabulous as a human, with that flowing red hair and those fine-boned features. This is a rare instance of meeting an actor in alien makeup and actually preferring the un-made-up version. Kevin: I think her scenes with B'Elanna were the best, since she does best with someone to spar off of, and the in-joke of acting with another half-Klingon woman was cute. She is a very good actress, and it's a shame we won't see her again until Enterprise several years from now. Matthew: Kate Mulgrew is the obvious standout among the main cast. She proves yet again that she can hold the stage against any performer, even a scenery chewer like de Lancie. Roxann Dawson had some nice repartee with Plakson, too. Kevin: Her speech at the end was pretty good, and again, brings the script this close to really succeeding as a story. Matthew: The Civil War interior sets and location shots were very pleasing. The uniforms looked rich, but not anachronistic or too clean. Janeway's dress was also fun to look at.The house interior was lovely, with neat windows and decorations, all of which got shot up pretty well in the action sequences. Kevin: I agree that story issues aside, the sets themselves were very good. I liked the outdoor sets a lot. I wonder how long it took to get in and out of that dress for Janeway on shooting days. Matthew: The space shots were decent, though nothing stood out as amazing. There were some clever "Q effects," none of which seemed to degrade the picture. Particularly clever was the shot in which Q puts Janeway in a pink nightie. They just obscured enough of both actors to make it seem like a continuous shot, when in fact both of them started in new positions without needing a funny looking optical to put them together. Kevin: The nova effects were okay, but nothing to write home about. And the puppy was super cute. And correct me if I am wrong, I think it's the same breed as her dog, Mollie. That was a nice touch. it's fun when it's on the screen, even if it leaves the mind shortly thereafter. Kevin: This episode definitely feels like they were searching for a reason to bring De Lancie back, though there are worse motivations. Q is at his best when there is a thread of something dark and interesting under the comedy and when there is a reason driving Q's actions even if that reason is known only to him. While far more successful than Q-Less, this still feels a little flat for me, especially since when I see a Q in the title, I ratchet up my expectations. Still, the acting alone keeps this in 3 territory. I agree with your 3, for a total of 6. Still, when a think about it, 3 is kind of the 2 for Q episodes.